My 3rd recipient was for a little girl called Brooke, who also lived in Kings Lynn; for this reason I decided to build and deliver both their devices at the same time, this did however double my workload ! 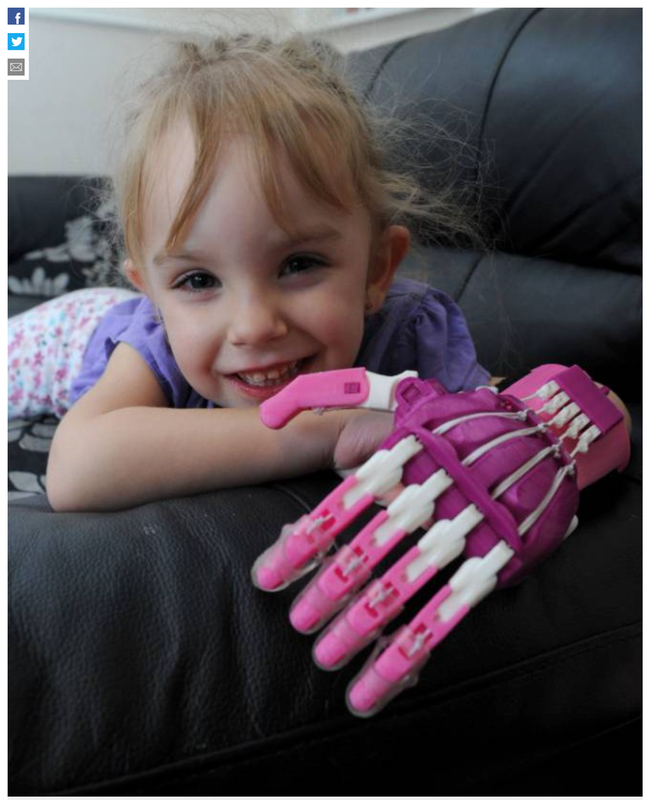 Brooke's mam Nichola had read an article on 3D printed hands and registered for one with e-NABLE, she was very excited and surprised when I contacted her to build a device for Brooke, and more surprised to find out I was based in Britain. Brooke's hand difference was caused by a medical condition known as symbrachydactyly, unlike my previous recipients who I believe to have been diagnosed with amniotic band syndrome (ABS). I hope no one ever asks me to pronounce that medical condition as I very much doubt I will get it right ! Like my previous build it began with measuring pictures her mam had taken when she had registered with e-NABLE and discussing with her what colour scheme Brooke would like for her device. Brooke wanted a device that had allot of purple and pink in it, preferably more pink. So from this colour scheme I went to work creating a mock up of what I could make for her; Brooke and her mam went on to call this her "Princess Hand." Printing Brooke's device went straight forward without any issues, and I was lucky that from my previous two recipients I already had some of the colours I needed. I printed all the parts over a three day period and then did the initial plastic part construction, I was very pleased with the results. Now all that remained was to wire it up with cord and elastic (which I still HATE doing), fit the padding and velcro to complete Brooke's device. With this device now complete and also my build for my second match Miley complete I set out on the 250 mile round trip on Saturday morning to deliver this and Miley's device for them. Nichola loved the device, she could not believe how well it matched the colour scheme and how it worked, Brooke was in a shy mood and so I left her with her new hand and re-assured Nichola that maybe in time she would like it, but if she didn't then no harm done ! I do know that she did in her own time take to her hand, as is evident in her appearing on BBC news, in the Mirror newspaper and also the Metro Website, she also appeared in The Times and The Sun national paper, more information on Brooke and her publicity can be found in THIS blog post. My 3rd recipient seems to have attracted quite a bit of media attention, she was on BBC Look North News, BBC Three counties radio and has been in several new paper reports. Brooke on BBC news can be seen below, my mock up design was even used as the background graphic on the report; with I thought was very cool. Her mam also did a phone interview with BBC Three Counties Radio which can be heard below. 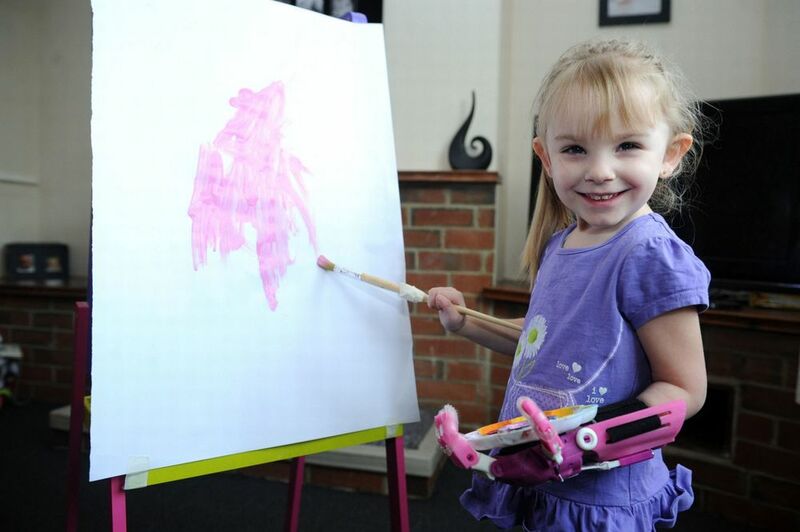 In the papers and online editions of papers Brooke has been in the following articles. I also managed to get some PDF proofs of her press articles that were in the printed press; these are below. I really liked the pictures the reporter took of Brooke and her Princess hand.